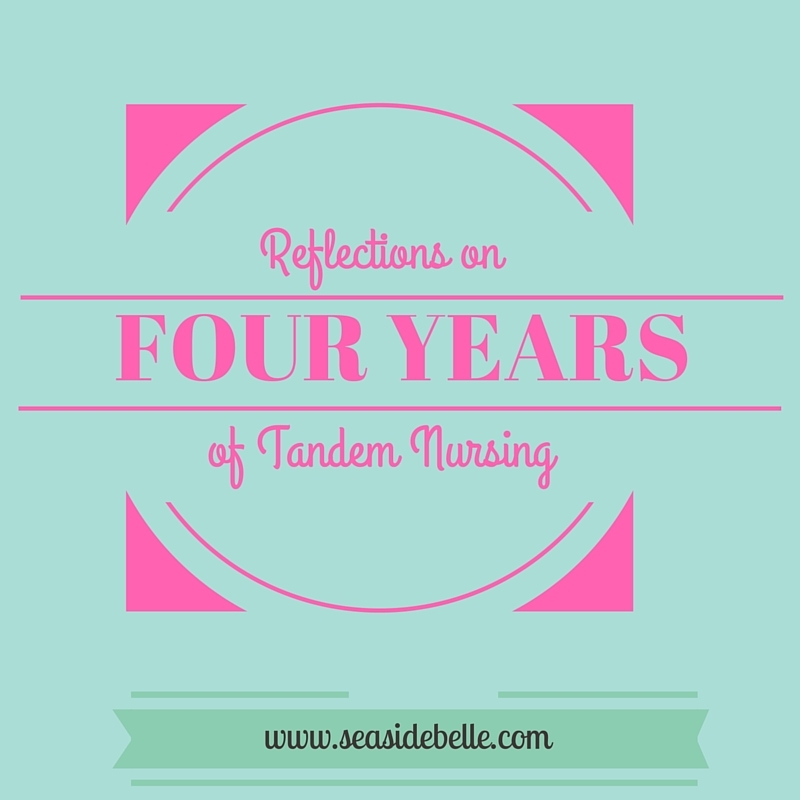 I have been tandem feeding for four years! When I first entered the realms of motherhood, I imagined breastfeeding for six months (or until my baby got teeth) before weaning. I had never heard of natural term weaning and I would have certainly done a double take if I'd seen anyone breastfeeding a toddler, let alone a pre-schooler. And I would have never even dreamt that mothers could feed a baby and an older child. Yup - I'd have thought I was a bit of a weirdo. But, here I am. I'm on my second tandem pairing and I'm currently breastfeeding a 14 month old and, as of today, a four year old. To be honest, I don't really know. I've just followed my instincts, responded to my children's needs and muddled through. I was lucky that I had a very easy pregnancy and that Beatrix didn't seem too bothered by any dips in supply. Some children self-wean, typically around halfway through the pregnancy, as they aren't getting as much, if any, milk. And Beatrix actually stopped feeding for around 10 days. I wasn't upset, as it was her choice. However, fate stepped in and she contracted Slapped Cheek Disease and returned to breastfeeding - her main comfort and nutrition and an easy way for her to boost her immune system. She then carried on nursing throughout pregnancy. I remember my first tandem feed vividly. Four years ago today, I gave birth to Wilfred in a beautiful home birth. He latched on pretty much straight away and I made sure he had a good feed. In fact, he was feeding when I introduced him to my older two. Beatrix was just shy of her second birthday and very attached to the breast. We'd spent the past few months talking about the fact that the new baby would need to breastfeed, and we'd role played with an assortment of soft toys and plastic dinosaurs, but I was nervous about her seeing someone else feeding from me. But she was immediately besotted with her new brother and fascinated that such a small thing could actually breastfeed. She kept saying "Baby an mulk" (Baby having milk). And I promised her that when he had finished, she would be able to have some too. A little later, I settled on the bed and began feeding Wilf again. Beatrix climbed up next to us and I managed to position her next to me so she could feed too. At this point, the midwife walked in to check we were OK before she left. She smiled and commented: "What a lovely sight and what a beautiful family." She will never know the power of those words and how they filled me with confidence and swelled my heart with pride. Our tandem journey had commenced. In fact, I very rarely feed both of my nurselings at the same time. It's a real faff to get positioned right and I feel like I'm exposing far too much flesh! But every now and then, it seems the right thing to do. Mostly, though I feed my little ones separately. They've definitely learnt about taking turns from a very young age! Beatrix self-weaned around Christmas time after she started school. It was a gradual process and it took a while for me to realise that she had stopped breastfeeding. At this point, I was about halfway through my pregnancy with Oswald, so I suspect the dip in supply may have been a contributing factor. Wilf, however, continued to breastfeed. This time, it was easier as he was older than Beatrix had been when I was pregnant with him, so he was not feeding as frequently as she had done. Wilf played an important role in the birth of Ossie. I'd been for a sweep that afternoon and had been uncomfortable ever since. I knew my body was gearing up for labour and it was feeding Wilf to sleep that kickstarted the contractions. We lay in his bed at 8pm and by 8.25 the tightenings had settled into some very regular contractions. Ossie arrived less than two hours later in another beautiful home birth. Ossie is now nearly 15 months old. He breastfeeds a lot. Wilf is pretty much down to bedtime and occasionally during the day if he is hurt, upset or knackered. Wilf starts school in September and I suspect our nursing journey is drawing to a close. I'll try and follow his lead. I've had terrible nursing aversion this time round (mostly due to tiredness I think), so I've had to set some limits on our breastfeeding, but we've reached a place now that we're both happy so we can continue until he is ready to wean. It will be very strange to be only breastfeeding one child. It's been a rollercoaster ride that I never dreamt I'd embark on, but I wouldn't change it for the world. As with all my parenting decisions, I've done what I thought was right for my family and circumstances based on the knowledge I had at the time. Have you or are you tandem feeding? What are your experiences? Thank you. It's a pretty special relationship isn't it. Yay to seeing what happens. It's weird when you start nursing a newborn alongside your older child and you look down and suddenly realise how big they've got. It's barely noticeable when you take things one day at a time. Thanks for your comment. It's a very special journey. What a lovely read! I think this will be so useful to so many people in this situation - so often you hear of pregnant women being told that tandem feeding just isn't possible, and your experience shows what a beautiful thing it is. 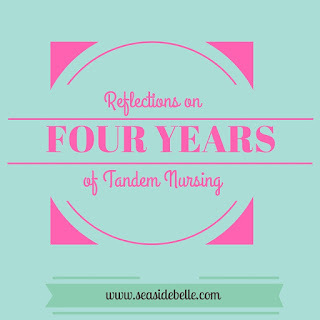 I'm sure it must be so emotional coming to the end of your tandem feeding journey - my hormones were all over the place when I stopped breastfeeding, I can imagine it's doubly so with tandem feeding! Thanks so much for sharing with us at #SharingtheBlogLove - I really hope you'll join us again next week! Thanks Katy. One of the great things about natural term breastfeeding is that weaning is so slow, sometimes almost imperceptible, that the hormone levels are pretty stable, so hopefully, reaching the end won't result in hormones being all over the place. I've loved sharing at #SharingtheBlogLove and will definitely be with you next week.